White Wolf : Giant Gray Wolf Greets Woman With Kisses And Cuddles in Colorado. 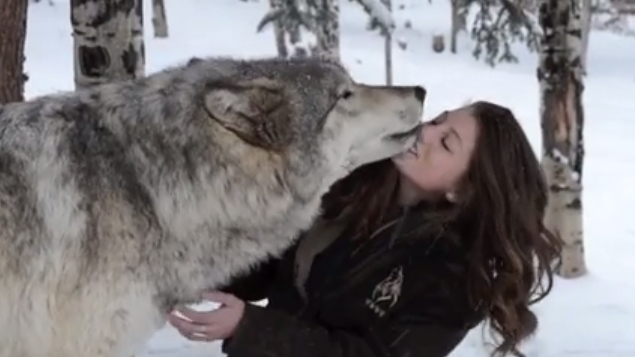 Giant Gray Wolf Greets Woman With Kisses And Cuddles in Colorado. Kekoa the wolf is a handsome young male who hase a sweet personality, which is good because he loves to greet with wolf kisses. When he puts his paws on a person's shoulders he towers at about 7 feet. After years of providing high quality, interactive, educational tours and programs regarding wolf and wildlife conservation, Colorado Wolf and Wildlife Center now reaches approximately 40,000 people per year. It is important to educate people about the beautiful and majestic wolf, along with other misunderstood wild canids, and the importance of their roles in our ecosystems. Responses to "Giant Gray Wolf Greets Woman With Kisses And Cuddles in Colorado." Beautiful ... just so beautiful ! Wolves are such magnificent creatures ... Kekoa may you have a long and wonderful life! I've been here! It's such an amazing place. I made sure I got the VIP pass to meet the wolves, what an unforgettable experience. What a wonderful gentle wolf. I love him. An experience like that would not only make my day - it would make my life! Wonderful! Wolf and Wildlife center in Colorado need Educated on Wolves. What a beautiful and majestic wolf! He reminds me of an Akita dog I had when I was 4 years old. He is so beautiful! I would love to spend days on end with wolves, and other large animals in a heart beat! They are my brothers and sisters and are a part of me. When they hurt, I hurt. Only if I could just be with them, my life would be totally complete! Wolves are kind, gentle, beautiful, amazing animals and should be protected at all costs. They are my brothers and sisters and I'm so sad because there was a death in the family. The last White wolf was shot and killed for sport. It's evil and cruel and wrong!